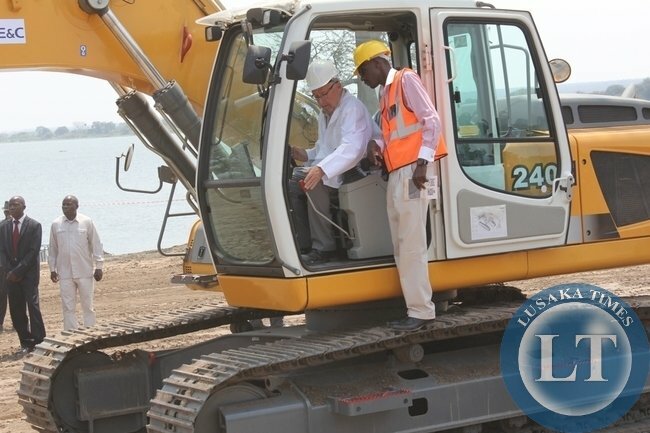 THE Governments of Zambia and Botswana have officially launched the commencement of construction works for Kazungula Bridge across the Zambezi River. Zambia’s Vice President Guy Scott and Botswana Vice President Ponatshego Kedikilwe officiated at the ground breaking ceremony yesterday on the Botswana side of the Kazungula Border. The US$ 259.3 project, whose construction works would start in few weeks time from now, would be completed by 2018. It will be financed by the Governments of Zambia and Botswana with financial assistance from the Japan International Cooperation Agency (JICA) and the African Development Bank (AfDB). Speaking during the ground breaking ceremony, Dr Scott said it was good that the project was finally being implemented as it had been on the drawing board for more than 10 years. Dr Scott appealed to the project team and the contractor, Daewoo Engineering and Construction including the supervising engineers, to ensure that the project was delivered within the planned timeframe and cost. He said the project should also be implemented according to stipulated standards and quality that the two Governments have prescribed in the contract that was signed a week ago,” Dr Scott said. Dr Scott said the project would create jobs, facilitate the movement of products within the region including agricultural inputs and mining equipment and increase opportunities for intra and regional trade activities. He also said the project would reduce the transit time from 36 hours to two hours and reduce transportation costs and the cost of doing business in general and ultimately increase revenue for the two countries. “The two peoples of Botswana and Zambia have waited for this project for this long and some imagined that this day would come in their life-time. The two Governments are equally delighted that the long awaited project is finally taking off today,” Dr Scott said. He said the Kazungula route had become increasingly popular to transporters shipping freight between the major ports of South Africa, to and from Lusaka, the mining towns of Northern Zambia and the Katanga province of the Democratic Republic of Congo (DRC). Speaking at the same gathering, Dr Kedikilwe urged the Ministries of Transport in the two countries to remain diligent in their work and guard against unnecessary cost escalations during construction. Dr Kedikilwe also urged the two Ministries to exercise professionalism to avoid delays and unnecessary litigation saying people’s expectations on the project were very high. He said the ground breaking ceremony was a landmark project to the two countries and the rest of the Southern African Development (SADC) region and the entire continent. Dr Kedikilwe said delays for the project were history currently the two countries were determined to executive the project. “This project demonstrates our resolve and determination to promote job creation as well as boost trade and regional integration,” he said. He said it was envisaged that the bridge would be a hub for economic activities for countries in Southern Africa. He said JICA had been and would remain a committed partner in working closely with the two African countries to achieve their goals of enhancing human resource development, infrastructure development and institutional strengthening. “We wish to register our sincere appreciation to the efforts of both countries and JICA hopes to continue working with the two African friends,” he said. Africa Development Band (AfDB) resident representative for Malawi Andrew Mwaba said the project was a major milestone in addressing trade bottlenecks between the two countries. Dr Mwaba said his Bank, which was celebrating 50 years this year, was repositioning itself to respond to the needs and the transformation of the continent. “This project will strengthen the already existing cooperation between the AfDB and the two countries. As a Bank, we will continue to assist countries in Africa on matters of bridging the infrastructure gap,” he said. Mr Molefhi said the Bridge and the one-stop border post were expected to unlock bilateral trade by speeding up the processing and movement of goods and people as well as create new opportunities and prospects in the region. 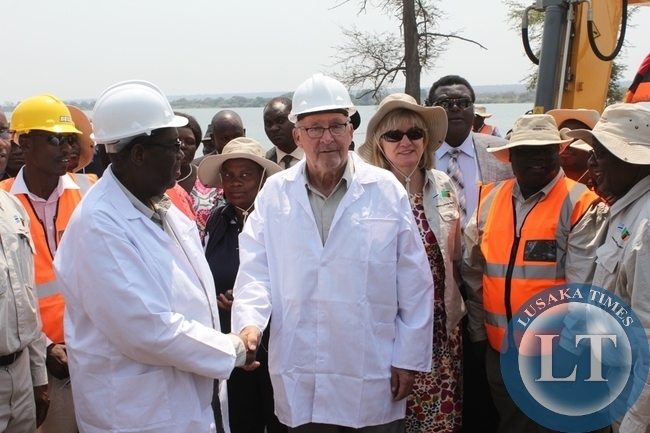 “I am very positive that the residents of Kazungula and neighbouring villages will never ever experience problems due to ferry breakdowns as the bridge and border facilities are coming at the time when they are needed the most,” he said. Zambia’s Transport, Works, Supply and Communication Minister Yamfwa Mukanga said Kazungula Bridge was one of the major projects to be undertaken in Zambia under the Patriotic front (PF) Government. In his vote of thanks, Mr Mukanga said the project was also expected to enhance the warm and cordial relations existing between the two countries. “ Our team will work tirelessly to do our level best to deliver the project according to the required standards and expectations of the two nations,” Mr Mukanga said. “The US$ 259.3 project, whose construction works would start in few weeks time from now, would be completed by 2018.” According to LT, this will be the most cheapest ever project. Even me I can finance it. LT is a lost cause. It is not wise to read if you are having a bad day I have come to realize. Hehehehe. I’ll match your pledge and we can build two bridges. What do you say? @Chekov, sure my man. You and I lets put the resources together and build two bridges. This is crap journalism LT, i can fund two similar bridges with the cash i am keeping for the weekend in my pocket right now! At that price, it hardly leaves anything for corruption – I’ll raise your bridge and see you another. @MM and Spuds. Let’s just put a $1000 each and build bridges all over! Ba LT. Why don’t you edit your articles? Is it because you want to be the first to break the news? You guys above that is the PF way, they reimbursed all currencies including dollar. Things are so cheap mwa Sata. Bravo!!! Bravisimo!!!! Very well done!!!!!!!!! Surely it cannot be that cheap, so you simply put “m”for million at the end of the number and your go on. This was just a human error omission and since we have computers that do not reason they accept that a bridge will be constructed at a cost of less than Us$ 300.00, cheaper than an iPhone. May be ba LT ni H/O. But if it’s true the bridge will cost a paltry US$259.3 (ZK1,595.20) why go with a begging bowl to Japan to finance the project, why, just one public spirited street vendor or marketeer or a school kid from her/his monthly allowance can finance this bridge. Guy Scott has better wife compared to his boss, both heart and looks. Just check her smile. BOTSWANA IS A COUNTRY THAT HAS PROSPERED SO MUCH WITHIN FEW YEARS TIME OVERTAKING EVEN COUNTRIES THAT GOT THEIR INDEPENDENCE FIRST IN AFRICA. BA LT, PLEASE ITS NOT launche BUT launch. IN YOUR EVERY ARTICLE THERE’S GRAMMAR, SPELLING, CONTEXTUAL, ETC ERRORS. PLEASE, SEND YOUR REPORTERS TO SCHOOL. the project is all ready started?